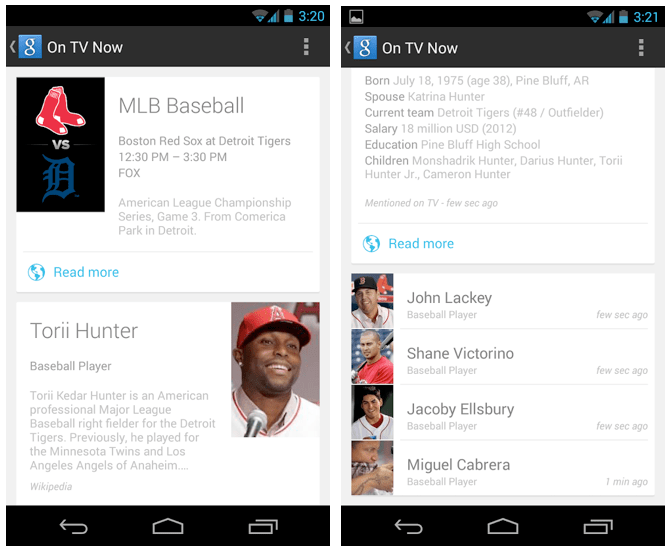 A while back, I promised some details on the Google Now TV Card I found accidentally. Freaky, right? I dismissed it, but my curiosity was peaked. So, I did some digging about the TV Card and went back to give it whirl. The card only works on broadcast TV, which makes sense when you reverse engineer it a little. Google Now knows where you are, and based on that, can determine the shows that are being broadcast. That helps narrow down the possibilities, but even given that information, I found the card a bit tough to trigger. I did my testing during daytime TV, and it failed to detect the Ellen DeGeneres show and another show I tried. It did finally work for the Fox broadcast of the MLB playoff series between the Tigers and Red Sox. If I remember correctly, the announcers were talking about Torii Hunter. Pretty interesting stuff, not mind-blowing, but interesting. This is a pretty powerful example of what Google wants to do though, which is integrate all it knows about the world and you, a.k.a. its knowledge graph, and provide what it thinks might be useful to you at the moment.